What beauties! You did a great job with the pate a choux. It is definitely an intimidating process, but as long as you practice and carefully read through the recipe like you say, it is surprisingly simple. And OMG, that chocolate coffee pastry cream! I love how you turned the first batch into "petit chocolate sticks"! great thinking!Congrats on making it to the second round. Oh my goodness!!! Those are absolutely beautiful!! I don't think I have the patience to do French pastry. I too get impatient, and skip recipes, or don't read properly. Congratulations on making it to the 2nd round, with this recipe I see no reason why you won't be in the third. Very nicely done!! You are KILLING me, these are gorgeous! Good for you for tackling one of the toughest cuisines in my book, and especially pastry! You are a brave woman. I will have to make these for my mom, she is the quintessential French Chef (meaning she puts about a pound of butter in EVERYTHING). OH MY GOODNESS do you know how much I LOVE eclairs!? 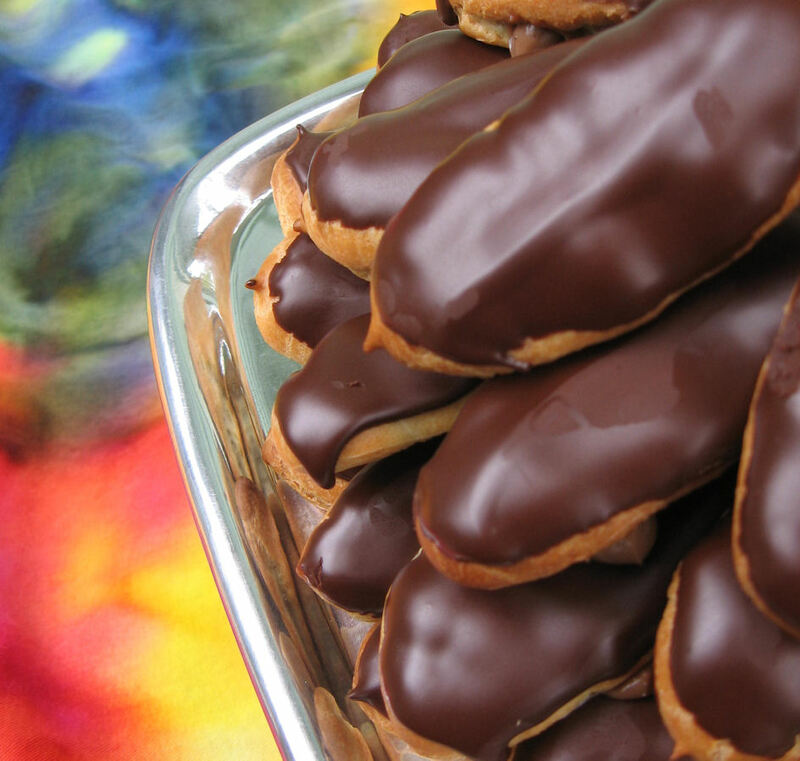 I'm drooling, your eclairs look so delicious and beautiful. You are seriously amazing to take on eclairs. Fantastic, amazing, incredible post!! Good luck. I can see why they disappeared so quickly--I could probably eat that whole tray by myself! Great job! good luck to you. they look delcious. Beautiful! I'm intimidated by eclairs- yours are gorgeous, and I'd love to have one right now! Good luck in the competition! I looooove eclairs, but have never had one with coffee before. Yours look delicious and so worth the work! I love eclairs and will never say no to one. It's a really nice feeling when there's so much effort put in reading and cooking, and when everything turns out good. Real satisfaction! Oh I love this post so much! You're hilarious...I must agree the French truly have perfected their éclairs, but you do it equally as well. It's so gratifying when you replicate something you've seen in a café or pastry shop window. Well done! They look amazing!! You certainly turned a kitchen nightmare into a success with those sticks! If they were in my presence they'd be gone at lightning speed, too. Good luck advancing to the 3d round! Wow, if a plate of these is right in front of me, it will be a flash of "now you see it, now you don't"!! Looks absolutely lovely! Good job! Megan, these turned out great! So, the other day when you wrote to me... is that the 1st batch or the 2nd? Beautiful post! Wishing you all the best & good luck! p/s I have an award for you. Please feel free to hop over to collect it. You deserve it. TQ! I had to immediately vote for you because your official entry photo made me want to head to my local bakery asap! Megan, These eclairs have my vote! I never even looked at a recipe for eclairs. You did a wonderful job with them, and I like the way that you turned the first batch into something wonderful as well. I was one of the lucky participants in the magic disappearance of the above eclairs. Wow, Megan, you are a goddess. What a great story. Just loved the creamy delicate flavor. You get my vote in whatever contest you enter! Thanks a whole bunch. It was a delightful evening. Yummy food and wonderful people. I look forward to testing many more of your culinary adventures. Gorgeous! You have my vote! Very fun. I think these are definitely one of those things that get easier with time as you get a feel for the dough and what not. You have my vote. Wow, how delicious does this look!? 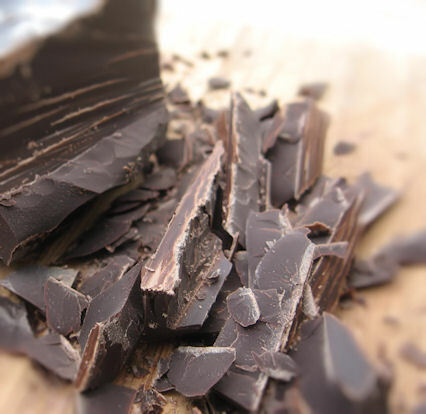 One of the things that makes eclairs in France so much better is the chocolate pastry cream. These look fantastic. As a french girl...these spoke to me! I'm so impressed with your eclairs...they look better than what I buy at the bakery. Thanky you so much for sharing...I'll be sure to cast my vote! You did a fantastic job on these and I like your take on the challenge. It really was all about getting outside your comfort zone. Great work, you got my vote! Ok, I am totally expecting a batch of these next time I am in Madison!! 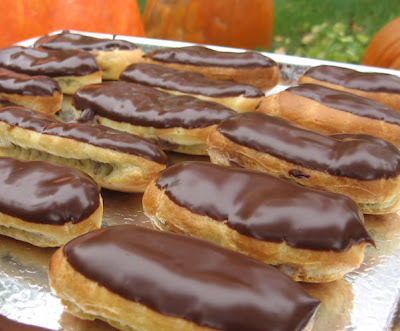 Eclairs are my number one favorite dessert and I looove dessert!!! Great éclairs. They remind me of my childhood, I ate a lot of them younger lol. 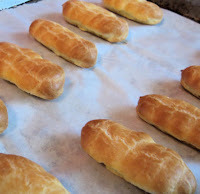 Pate a Choux can be a pain but its a fun one to master, try a Paris Brest next! Voting for you and please vote for me too! 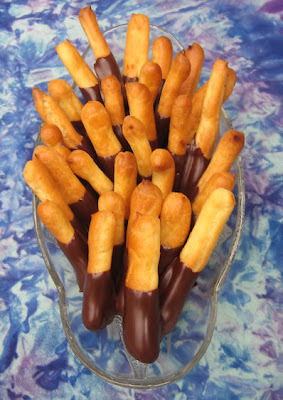 olala....love these chocolate eclairs! Ain't they just wonderful!! This looks wonderful…Good luck in the competition! French pastry is definitely no joke! I made croissants the other day and they worked out well but not quite the French standard! Bonne chance, bon courage, et bon appetit. Catchy title... and the eclairs look awesome..
you have got my VOTE! I love what you did with the ones that went wrong!! :) got my vote! I've made this before!!!! But they didn't turn out as nice and professional as yours. I also left out the glaze because I was lazy and cheap, tee hee. Awesome job. You've got my vote! p.s. I don't think that no-French thing is mandatory! XOXO best of luck! You've got my vote! Mmm, I love eclairs. That top picture with the chocolate icing all glossy looks almost too good to eat. Yum! Hi Megan, it's me again! I have an award for you. Please do drop by to pick it up when you can. I'm glad to know you even if it's only through blogging! You have a lovely site. Have a nice day. they just look so wonderful and delicious. Great post! In the end the mess ups look just as temping as the "good" ones. Great job. I voted for you! Even your mistakes look beautiful. Growing up my parents would give me an éclair if they wanted a moment of silence. Voting for you, hope to see you in round three! Seriously?! 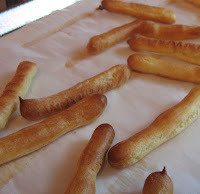 Super impressed you made éclairs...I've always wanted to try but have been held back by fear. Good for you! Those couldn't look any more delicious! They turned out perfect - some of the best I've ever seen. Good luck in this round! Those look professional (and delicious!) Good luck with round 2. Very impressive! I envy your baking abilities and love that you were able to find another use for your 'failures'. Sending my vote and the best of luck as you proceed through the PFB challenge! Looks like your eclairs turned out really well. The pâte à choux looks beautifully browned and airy-light. These are delicious. 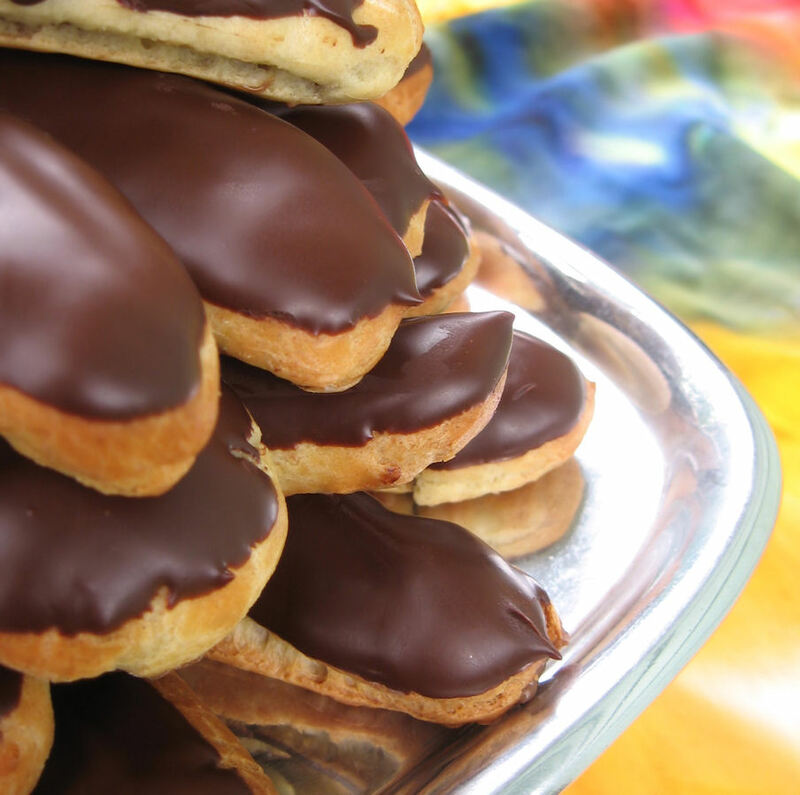 At least you can say you have made french eclairs - something a lot of people can't say. I wish I had one right now. By the way, I love your blog and have given you an award on my site. Congratulations on making it to the next round! Catching up on commenting - but did vote for you. I mean - you made exclairs - aside form the fact that it's one of my favorite desserts - it's exclairs - does anyody have a comfort zone with eclairs? And they look oo la la! Your eclairs look perfect! You have to tell me what you did wrong, I am all worried now, but will definitely be sure to follow your directions, thanks!